we arrived around 2 p.m. and was greeted with the POC with smiles and everyone expressing how much they appreciated us being there. 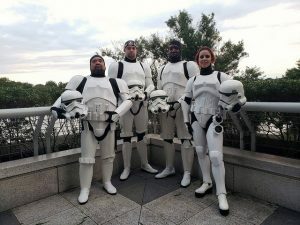 POC escorted us down to our changing area ( bathroom ) , POC proceeded to inform us that we were going on to come out as the key performed their last number, the Star Wars theme and imperial March among a few other favorites. As we Waited , there were a few of the musicians that saw us while they were backstage and excitedly wanted a few photos and told us how ‘ awesome you guys are ! , great looking ! ‘ some more time passed and then finally our moment was upon us ! 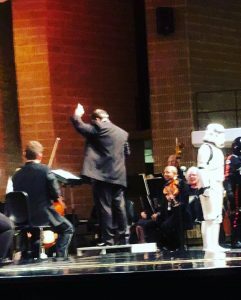 We were told that they wanted us to line up on each side of the stage with the storm trooper ( Brian ) in the center as they played. People were all smiles and taking photos as we stood on stage as the music played . After the music ended , we were instructed to mingle with the crowd if we could and take photos with everyone that wanted , and exchanged excited laughter and high fives ! huge shout out to Jeanne Aiken , whom was a big help in guiding us around and helping out with the costumes! – Photos to PR email are inbound ! 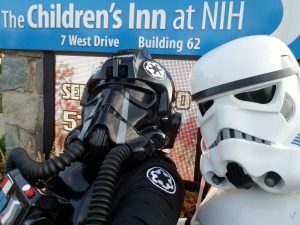 The Rebel Legion decided to induct a recurring resident of the Ronald McDonald House of Baltimore as an Honorary Member of their ranks; they invited the 501st to send an Honor Guard, and both OLG and GT were in attendance. The Emperor himself made an appearance, and introduced one of his apprentices: Darth Maul. The young dark lord is the favorite of inductee. 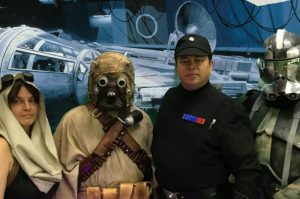 Surrounded by all the Star Wars characters, the Rebel Legion presented him with a Honorary Member Certificate; the Empire is lucky to have such a cunning spy within the ranks of the Rebel Legion. 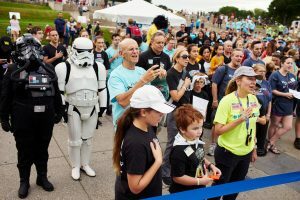 Both the child and his mother were overcome with emotion from the support shown by all the Star Wars groups. GT recorded a brief interview with the young fan, who explained that the Sith Lords were his favorite of all Star Wars characters. Big school but very nice accommodations in a large music room given water and pizza leftover still warm. After a quick brief about what was going to be our strategic insertion into the halftime show. We suited up and headed down to the field. Waving and pictures on the way. (Did get I love you Darth Vader) We lined up waiting for our cue. Then it happen we walked 3 paces onto the field turned and waved after halftime we mingled with the younglings for pictures on the track and in front of the stands. Luckily we had a squire and helmet free to wander in the dark. Returned to the music room dekitted and walked out together. I believe the FB team won as well. Photos submitted to PR email. We arrived at the location and we’re led to our secure changing area by our event host. Our area was stocked with water and cookies which was nice. We suited up and began our patrol of the premises. Upon reaching the main part of the library, we stumbled upon a costume contest for kids. 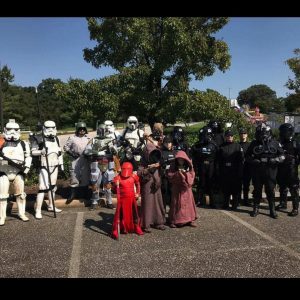 It was refreshing to see some children dressed as First Order Stormtroopers as well as one pint-sized Kylo Ren. 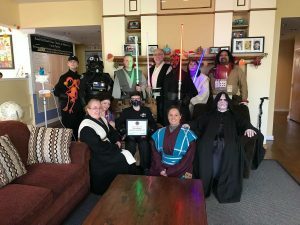 After the contest, we hung around and took photos with the guests, patrolled the main entrance and interacted with the staff who had tables set up. We were then invited up for pizza in the break room by the library staff. Several of our troopers took a quick break for lunch before returning to duty. After a few hours, we retired to the changing area to return to our civilian clothes and exit the location. A pleasant break from the heat to support a very important cause! The troops arrived at the VIP parking lot and donned their gear at the vehicles. Vendors were setup with tables in the shadow of Camden Yards in a very nice area lined with trees facing the Baltimore Ravens stadium. As participants began to arrive and check-in, we greeted them with high fives and fist bumps. 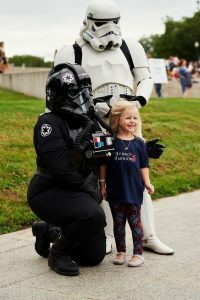 Several small children slowly warmed to the Empire’s protective presence. 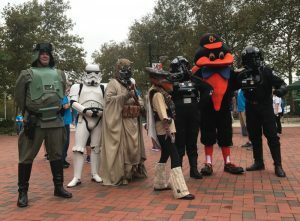 The Baltimore Orioles mascot came out and joined us for photos. After a rousing opening ceremony, we cheered the walkers as they headed out from the starting line. The library was very gracious and shared their employee break room for the Empire to change into gear. The library wanted to ensure maximum energy levels for the troopers, and provided 3 dozen donuts so personnel could carb up. The garrison marched into the public library space shortly after 1100 hours, and greeted the many wide eyed visitors. An Imperial officer introduced the many different ways to serve in the Empire, and reminded the galactic citizens that in spite of what they may have read and seen in the obviously slanted historical documents, the Empire is the rightfully “elected” government. 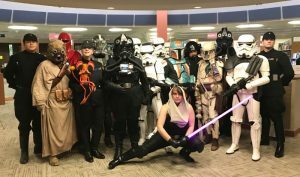 The garrison then patrolled the library, posing for pictures with the delighted patrons, and participated in arts and crafts. Around 1300 hours, the troopers were recalled to the Imperial shuttle and were extracted from the landing zone. Arrived shortly after noon, met up with event coordinator whom said changing area was sane as day before . Barn area in the back . Once suited up , came out and mingled with fans/people , smiles were wide and most had no idea what character or who I was period haha, had a few immediately run up for high fives and hugs , most young kids were real skiddish of me and unsure if I was good or bad lol , needed a lot of reassurance but once they knew I was a ‘good ‘ guy then they opened up a little more . The crowd was not as nearly as big as the day before but still a great day. A few of the kids ran up and said ‘ do the roar ! ‘ and jumped up and down after hearing it , took photos with those whom were willing ( haha ) and as the event winded down , thanked the coordinator for having us out and look forward to any future events ! An annual event arranged by Anne Arundel County Firefighters to raise money for The Children’s Cancer Foundation. This is the second year Old Line Garrison (OLG) has supported this event and hope to see its continued growth. Prior to arrival a Facebook Messenger group was created for all to coordinate arrivals. This worked well to precoordinate prior to event arrival. Troopers began to arrive at 1030 Local. Event lead made contact with the POC shortly after his arrival. Troopers were provided with a trailer to change and congregate. With the number of Troopers and size of the trailer most Troopers came in partial kit and/or changed quickly next to our transports. The trailer was reserved for those needing more time and help to kit up. This was precoordinated after reconnaissance from Garrison Command. Event organizers provided Troopers with water throughout the event and delivered lunch provided by Mission BBQ. Troopers were in gear at approximately 1155 at which time we took the group photo provided to Garrison PR. We then roamed the event for photo opportunities interacting with the crowd and the first responders present at the event. The main issue today was the ambient temperature. Troopers used the trailer and provided water to stay hydrated as best we could. Troopers began to depart around 1500. Event lead departed at 1559. – Photos Submitted to Garrison PR. Official photo courtesy of Kirk Douglass. Bester Community of Hope is located in the Washington County school district of Hagerstown MD. This event will be our third annual Block party. Each block party has been bigger and better with over a thousand attendees the first year; and around 2000 attendees last year. It is a community event designed to bring community resources together under one big tent or one big field, with the families and children of the community. In addition to our core mission, we provide music, games and fun–top notch entertainment, and we try to bring a learning element together to support our neighborhood families and children. The Fall Block Party is one of about three signature events that Bester Community of Hope does in the community for the community. We look forward to hearing from you and working out any details. Thank you in advance for your consideration. Referred by: Our Executive Director Keith Fanjoy is the first one to hear of you guys. 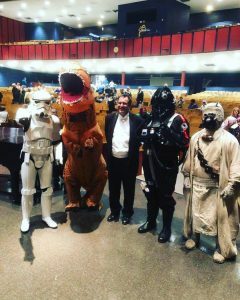 He may have caught a performance in West Virginia–(He is an alum of Shepard University and CEO of San Mar Home of Boonsboro, MD) of which Bester Community of Hope is an Initiative created to serve the under-served needs of children and families, of the Bester school area. (The most needy and impoverished district in our area–and the most grateful). And we strive to strengthen families and support communities, so they can in turn be more supportive of children and families in their district and eventually we hope city-wide and state-wide. We also welcome partners to work with and we would love to work with you. Suggested Arrival Time is 60 minutes before the event Start Time. 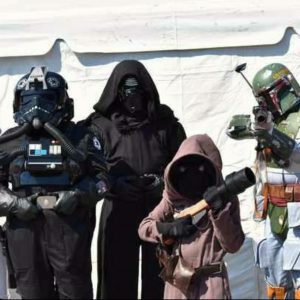 Other 501st Garrisons, the Rebel Legion, the Mandalorian Mercenaries Costuming Club, and R2DC are welcome to attend. We arrived promptly at 7:15am and checked in with our host. We were already in kit, so we immediately began mingling with the crowd. 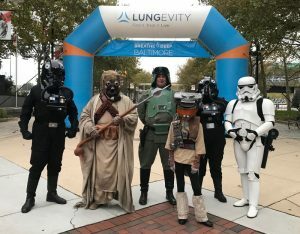 5K runs are always full of excitement and people who love to see the costumed characters who have come out to cheer them on – this event was no exception. We stood for many photos and wished all the runners luck before the race. We ran into a number of local sports-teams’ mascots. Each one of them thought it was funny to pantomime a lightsaber. 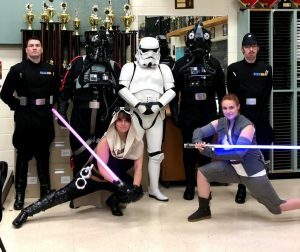 We played into it and explained, “your imaginary lightsaber doesn’t stand a chance against a blast from our imaginary Death Star!” The mascots all reacted in mock defeat. The crowd loved it. As the runners lined up to begin, we positioned ourselves along the course’s edge and offered high-fives to the runners as they ran passed. We knew this was a good crowd when several runners went past, turned around, and came back for a high-five before picking up their pace back into the run. We waited for the runners to return and cheered them to a great finish. This event also sponsors a 1K walk; we will very likely be back next year and register to walk in kit. Security was a little tighter than with past events, so we were slightly delayed. The Children’s Inn has adapted to their damaged roof by shifting rooms and staff offices and moving the front entrance. We met up with our host who was excited to have us and mentioned that they can always count on us when we are invited. We also made the offer to help in a non-costumed capacity if they have any more moving or recovery from the roof damage. We got ready in the arts and crafts room, where they usually station us. The room has been halved in order to accommodate some makeshift office space but it is still spacious and comfortable. Once we were ready, we headed out to where a couple dozen motorcycles were parked by the entrance. Children and adults were thrilled at our presence and we posed for several photos. 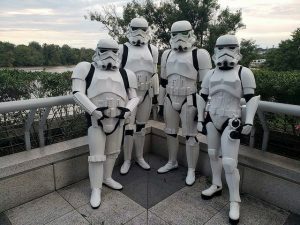 Several of the bikers were impressed by TI-13621’s Imperial-issue gauntlets and remarked that they would be good for riding. 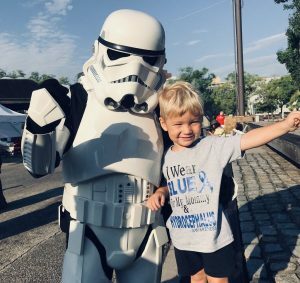 Only a few younglings were afraid to take advantage of the photo op and maintained a safe but friendly distance. After about an hour and a half, the event began to wind down and several of the bikers headed out. We took that opportunity to visit with the security guards and pose for a few more photos. 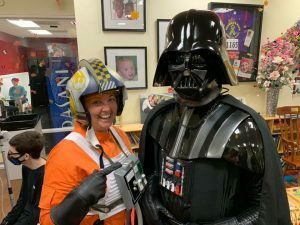 When we re-entered the building, a youngling named Tyler insisted on taking us upstairs to the dining room, where a few more families took the opportunity to meet us. As we were about to head down, a girl who had been previously too scared to take a picture with us approached us, gave us some shy high-fives and, beaming, posed for several photos. With that, our work was done and we headed down to change and depart. Troopers arrived before 4pm in Kennedy Center parking garage. No issues with using provided parking vouchers. and escorted by another new POC, Ashley, for the dance portion of the evening which lasted until 11pm. Dancing in TK armor is a challenge. It definitely requires a handler nearby. TK 50116’s thermal detonator got knocked off a few times during the bumping around on the dance floor. floor got rowdy and it was time to go. We arrived around 7:00 and suited up, getting to the walk site around 7:45. We took photos and gave high-fives. Mary was amazing at drawing out some of the shy children. 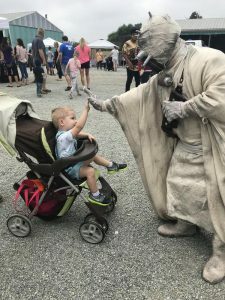 One little boy was a huge Star Wars fan and was completely overwhelmed by our presence. He couldn’t quite handle photos but started to come out of his shell shock a bit more towards the end. His mother is considering putting in an event request when his birthday comes around. The walk got underway a little after 9:00 and we posted ourselves at the starting line to cheer on the walkers. Once the walk got underway, we posed for a few more photos before the heat became punishing and we headed back to hydrate and de-kit. LexiCon is an annual event held by the St. Mary’s County Library System at the Lexington Park, MD branch. A small mixed genre convention in the NAS Patuxent River Area. Troopers started to arrive at 1115. Event guests started arriving shortly before 1200. Troopers stayed for the most part near the entrance of the event posing for photo ops. Periodic strolls through the library were performed thorough the day. Almost interaction with fans was in the form of photo ops. Occasionally discussions about our costume construction and the construction of the droid occurred. We were given a small break room for changing and storage. As usual Lord Vader and a Droid present were key attractions. Troopers began to de-kit after 1500 as individual fatigue set in. Event ended at 1600. Final troopers de-kitted and all departed by 1615. 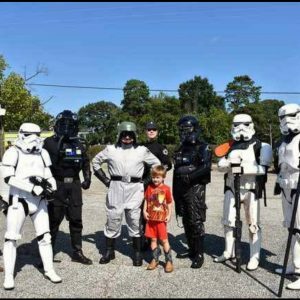 Today’s event had all the Troopers who live in the Pax River area present and serving the Empire. Event lead had discussions with St. Mary’s County Sheriff’s Department and the Calvert County Library System regarding requesting Troopers to appear at their upcoming events. They were referred to the websites for appearance requests. Suggestion for event leads need to have a handful of Garrison cards with the website address to give out to such inquiries. Today’s event lead did not have any. 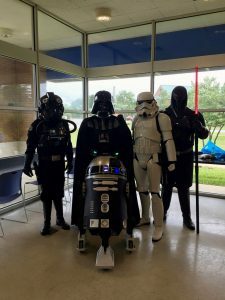 The Lexington Park Librarians were very appreciative of the Legions being there and will relay to the other Librarians in the St. Mary’s County Library system about us for future events. – Photos Submitted to PR via email. 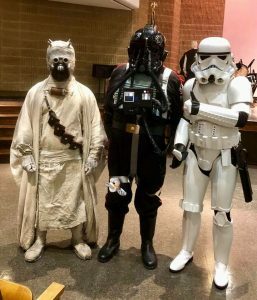 Photographer was library event staff who used Jedi Master Linda Ward’s iPhone after taking photos for the library. Permission to share these photos is granted. Event lead will patrol Library Social Media for official photos to be posted.